The UK has very confusing parking restrictions, in London each borough is divided into parking zones each with their own set of parking restrictions. 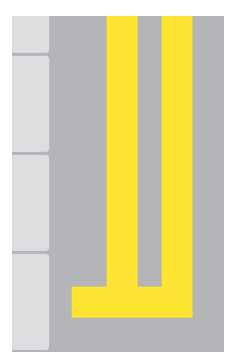 Single Yellow Lines: You can only park on a single yellow line outside of the restricted times, these are usually office hours of Mon-Fri 9am to 6pm but they vary considerably from zone to zone, use our parking map to find the restricted parking times in London parking zones. Double Yellow Lines: Parking is prohibited on double yellow lines at any time although you may stop to load or unload or drop off a passenger. Red lines: The same as yellow line but you cannot stop for any reason. Residents parking bays usually have the same parking restrictions but not always so always check the white signs. The same general rules apply to pay and display bays but not to suspended bays. You must not load or unload from bays for specific users eg doctor's or Smithfield Market. If you need longer than 40 minutes to load or unload, eg scaffolding, office relocations, etc then you will need to obtain a dispensation permit in advance and display it to allow you the extra time. Loading and unloading is prohibited at all times. A nearby white time plate will state 'no loading at any time'. Loading and unloading is prohibited between the times shown on the nearby white time plate. You may stop briefly to pick up or set down passengers. You can load or unload for a maximum of 40 minutes. A Civil Enforcement Officer (CEO) will observe a private vehicle for five minutes and a commercial vehicle for 10 minutes and look for loading activity. If the CEO doesn't see any loading or unloading activity or it's not continuous the CEO may issue a parking ticket.